"Till I see thee again." An Oil on canvas laid to board. Measuring 24 ¾" x 30 ¼" (630 x 768mm approx) res. This fine work was offered on behalf of a North American client. Thomas Faed: A British painter in oils and water colour of genre, portraits, interiors and domestic scenes. Faed is held by many as having done for Scottish Art what Burns did for Scottish song. Pathos being the staple of his success. Born 8th June 1826- in Gatehouse-of-Fleet, Kirkcudbright Scotland (Burley Mill,) Brought up the son of a skilled millwright, one of six, older brother to James a mezzotint engraver (qv) and the younger brother of notable Scottish artist, John Faed ( miniaturist) from whom he received great encouragement and his first lessons in his craft. His first oil picture 'Interior with figures', was painted when he was only 12 years of age and now hangs in the Glasgow Art Gallery. At 16 Thomas was sent to take up an apprenticeship as a draper, however his passion for art was too strong and he soon left for Edinburgh to help his brother John with the construction of miniatures for which he is significantly noted. In 1843, at the age of 17, travelling to Edinburgh, he joined his brother and enrolled at the Trustees Academy, where he won first prize in the life class. He did not flourish here however and continued his art education under Sir William Allen at the Edinburgh School of Design and most notably Thomas Duncan who took the colour class. Here was a man who was hugely influential on young Thomas's career. His earliest exhibited work was in fact a watercolour, A scene from the Old English Baron, shown at the RSA when he was only 18. By the late 1840's he had successfully illustrated Walter Scott's 'Heart of Midlothian' and achieved the coveted Heyward Gold Medal at Manchester. In 1847, he exhibited the 'Draught Players' which encouraged him to become a regular exhibitor at every occasion possible. By 1849 Faed had exhibited six paintings at the Royal Scottish Academy including 'Scott and his literary friends' and 'Friends at Abbotsfords' ( engraved by James Faed) and was made an Associate of the Academy, with all of his paintings selling on the first day of the exhibition. In 1851 he had a further three works hanging at the Royal Academy. Here began a long and notable career with a steady stream of exhibits totaling 98 in number between his most productive years of 1851 to 1893. 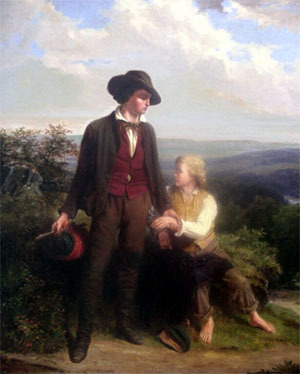 1852 saw the ambitious young artist Thomas Faed, settling in London and in 1855 he sent to the Royal Academy his 'Mitherless Bairn,' the first of his pictures of great character illustrating homely rural life which were to bring him public acclaim and into artistic prominence. After his McGeoch relations emigrated to Canada, he decided to paint a series of works with a Canadian background. Thus the trilogy was born, though it took him years to complete. 'Oh why have I left my hame?' 27 years later. Faed's carefully composed and finely painted rural scenes of Scottish folk and daily life, appealed enormously to the Victorian public and whilst he played upon their emotions with his choice of subject matter, he never seemed to let things degenerate into pure sentimentalism. As an artist, he instead, was a great recorder and reveled in quality of light and capturing the simpleness of the moment. His works were always noble, but built of a nobleness far away from nobility itself. In his lifetime, Tom Faed also painted a number of canvases depicting single figures. These in the main were usually pretty girls in landscapes and these particular works had great influence upon artist friends such as Robert Herdman with whom he had trained. Technically speaking, Thomas Faed was indeed an 'expert' and his handling of oil paint in Interior genre scenes, of figures, landscapes and still-life detail and his adept application to composition and colour rarely, if ever failed him. Somehow Faed had the uncanny knack of being able to relate his subjects directly to the public perception. "Paint the gutter children rather than Helen of Troy, Agamemnon or Achillies." Thomas Faed retired due to increasing blindness in 1893 and died in St Johns Wood, London in the first year of the 20th Century. Evangeline (Longfellows heroine from the poem of the same name) and immensely popularised once engraved by James Faed in 1856, giving him critical acclaim in America. 1857- The First break in the family. 1859- Sunday in the backwoods. 1868- Worn Out, The Flower of Dunblane and The Cradle. 1870- The Highland Mother and When the Day is Done. 1871- A Wee Bit Fractious. 1872- God's Acre and Winter. These pictures all proved so popular that commercial engravings made them familiar both in Europe and America. "Faed's pleasing children's faces, his bright though patchy colour (rich, thick and treacly) the somewhat studious and elaborate picturesqueness, easy sentimentalism, and allusions which no one can misunderstand,-all these qualities show no signs of falling off, and in the 'Mithereless Bairn,' will exert there usual effect over the passing spectator. Mr Faed's work generally pleases for the moment but seems to us deficient in the simplicity and thoroughness without which, scenes from common life of the pathetic order cannot maintain a lasting interest. Meanwhile he pleases and should hence be encouraged to do more justice to the powers. It is the translation into painting of a subject suited to a poem. It is illustrative and readable, and in a technical merit of a certain kind, it is in many respects, admirable. It is rather poetic that artistic, if the distinction explains itself. The conspicuous values are in the telling of the story, rather than the in the pictorial treatment. Prof. WEIR Official Report of the American Centennial Exhibition of 1876. "There are painters who observe and see what they see and others who paint what they are instructed to see or what they conceive the masters painted before them. The first speak with the personal, the intimate note, the second with often the mere parrot voice of artistic convention. That the outout of Thomas Faed belongs to the former category is a matter which hardly needs demonstration." Life is not with him a mere desperate struggle for existence. Into the lot of the meanest and poorest there enter compensations, begotten of love and unselfishness and faith. Mr Faed is one of the most popular of the brigade of London/Scottish artists that include so many distinguished men. Success has not spoiled him, there is a fine sturdy commonsense in all his ways and words as refreshing as the breeze that blows over the moors and mosses of his native Galloway. .these were the qualities which dominated his practice during his prime, and it follows that his most successful pictures are those dealing with indoor incidents." Notes and Sketchbooks of Thomas Faed. The author of this compilation page of archival educational information, is indebted to the invaluable imput of the many scholars and academics throughout the world who have freely and generously forwarded information to us, including documentation, facts, images and or quotations in regard to the subject matter we discuss. We have referred to and collated this information from many sources and from contributors of what we measured as offering us, ' reliable and quality information' most of which is available on the internet. We have striven to accurately compile this page for purely educational and informative purposes and have sought to maintain its accuracy. If we have been remiss in neglecting to name them all, we apologise, as we do for any infringement of copyright which we have no knowledge of. No malintent nor disregard is or was intended, nor any profit sought from its inclusion or provision. Should errors, erratum or factual misinformation be present, we would be delighted to receive clarification and corrective information along with cross references for us to check We strive to keep this page factually accurate and updated for your continued enjoyment. High quality - colour accurate images in TIFF format are available upon request, downloadable from our FTP site or direct to you by e mail as a JPEG image..